There's nothing like a listening to Christmas music by a fireplace full of burning logs. But what if you don't have a fireplace? 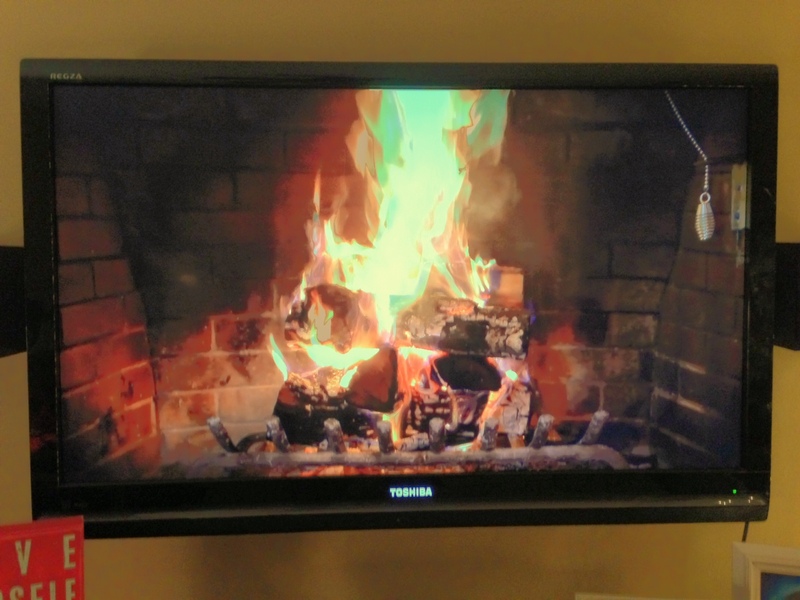 I stumbled across an app for the iPhone or iPad that, if you have an Apple TV, turns your big screen TV into a nice roaring fire. 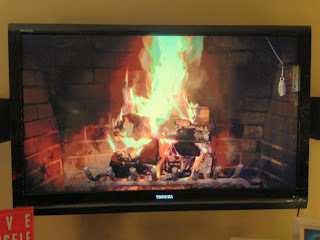 A Very Cozy Fireplace HD turns your HD TV into a high-definition fireplace with a roaring and crackling fire. For $0.99 (at the time I write this), you get an app for your iPhone or iPad that, when you launch it, plays a video of logs burning in a fireplace. To play it on your Apple TV, just choose the AirPlay option from the app. The video is very short but seemlessly loops to give the appearance of an a continuously burning fire. The video is very high quality and looks excellent on a big screen TV. The picture at the top of this post doesn't quite do it justice. The app has the ability to play music from your music (formerly iPod) app while displaying. If you have your HD TV hooked up to your surround sound you'll be able to maximize your Christmas music experience. The crackling of the fire continues while the music plays as if the fire were real. You can adjust the volume of the music independently from the volume of the fire itself if you want less crackle with your yuletide sounds. The app will allow you to use your iPhone or iPad at the same time you AirPlay to your Apple TV as long as you don't play any media. This means you can send emails, look at pictures, check Twitter or Facebook, or surf the web while the fire continues to burn and your music continues to play. The only complaint I had was that you couldn't shuffle your music and that if you choose to "Select songs from iPod Library" a second time, you have to start over selecting the songs. For the price though, it's great ambiance.